This recipe is simple to prepare, but always impressive. You can skewer the shrimp and make the easy lemon aioli ahead of time, which makes it a great dish for outdoor entertaining. The dish makes a great appetizer as well as main course. Make the aioli: In a small bowl, whisk together the mayonnaise, tarragon, garlic, lemon zest, lemon juice, cayenne, and salt and pepper to taste. Grill the shrimp: In a medium bowl, combine the shrimp, olive oil, paprika, and salt. Toss thoroughly and then skewer the shrimp on skewers (Note: If using bamboo skewers, it's best to first soak skewers for a couple hours in water so they don't burn on the grill). Preheat a gas grill to medium-high or prepare a medium-hot charcoal fire. Grill the shrimp for 2 to 3 minutes per side, or until just cooked through. Serve the shrimp hot with the lemon aioli on the side. • Aioli is basically a homemade mayonnaise, made wth egg yolks, oil, Dijon mustard, and garlic, and has an infinite amount of variations. This version, made with lemon and garlic is a French classic, but you can flavor the mix with any type of chopped fresh herbs, hot sauce (such as sriracha), and citrus other than lemon. 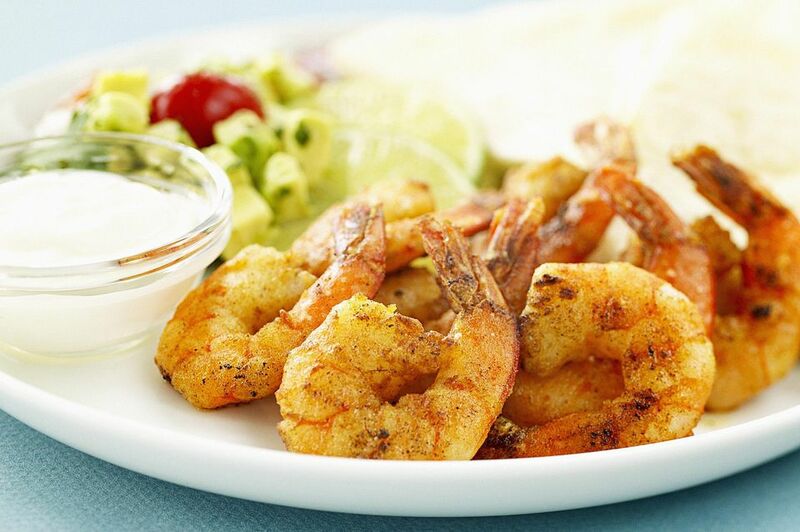 • Large or extra-large shrimp are best for grilling, as they are less likely to dry out. Use uniform-size shrimp for even cooking, and do not thread them too close together on the skewer. • Deveining small shrimp is optional, but in bigger shrimp the black intestinal vein is larger and can be gritty, so it should be removed. • Uncooked shrimp should be refrigerated immediately, and should be cooked as soon as possible. Cooked shrimp can be refrigerated up to three days. Cooked or uncooked shrimp can be frozen up to 3 months and thawed in the refrigerator. • Shrimp are graded according to count size, which is good to use as a gauge when buying for consistently. For small shrimp, the count is 51 to 60 per pound. Larger sizes are labeled with a U before the number. For example, U/12 means that there are under 12 shrimp in one pound.